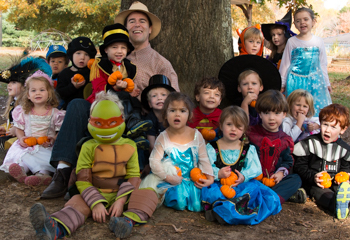 Halloween celebrations across the School began with a morning Pre-School and Junior Kindergarten costume parade throughout the Learning Village, and the annual Farmer Lourie’s Pumpkin Patch complete with a reading of Plumply, Dumply Pumpkin to gathered students and families. This year, students also joined in singing a few Halloween songs and each had the opportunity to select two pumpkins from the patch. Lunch time saw the senior class travel in costume to the Learning Village to visit classrooms, and in the afternoon a Kindergarten – Grade Four parade also included eighth grade students for the first time. Students in various parades wore an array of creative costumes, from well-known superheroes to beloved book characters. Pirates, witches, dinosaurs, princesses, and even a peacock were also spotted wandering the halls. Click here to view a photo gallery of the pumpkin patch and here to view a photo gallery of the afternoon activities. This post was written by STABCandM on Friday, October 31, 2014, 17:49. STABCandM has written 175 posts on this blog.